The guild leaderboards will be threshold based (not competitive), but there will be a competitive leaderboard for individuals across all guilds. You will be able to freely join and leave guilds throughout the event, but will only receive rewards for the guild you are in when the event ends. The event dungeons will require Courage, not Stamina to run. The event dungeons will get more difficult every time you beat them, and any heroes that are KO'd at the end of a dungeon run will not be usable again until the next day at 3pm CST, unless you do a roster refresh. As the dungeon gets harder, the amount of Guild Points paid out will increase. If you do a roster refresh, the dungeon's difficulty will be reset, as will the Guild Point bonuses. At 3pm CST each day, the previous day's dungeon will disappear, your roster will be refreshed, and a new event dungeon will become available. The event will end at 3pm on Monday, February 19th to allow guilds a full day to run the last dungeon and get their scores as high as possible. If your team is KO'd in the middle of a dungeon, you will get Guild Points relative to your progress in the dungeon. When you re-enter the dungeon, you will start back at the first room, but the difficulty will not be reset. Only a roster refresh or the opening of a new event dungeon will reset the difficulty. The amount of courage required to run the event dungeons will remain consistent, even as difficulty increases. This event does not include a new hero release. Details are subject to change before the start of the event, with the exception of the threshold guild leaderboards, which we can promise with certainty. How much gems will a roster refresh be ? Will there be a guild point boost in the shop for gems , similar to the one from the last guild games ? I love the idea of progressively harder content and getting to utilize our whole roster! Will it "snapshot" our roster when we begin, or can we move our best runes from hero group to hero group if we want? Will Zomm Zomminions convert back to the main character at the completion of the dungeon? No snapshot. If you want to move around runes, you're more than welcome to do so. How much gems will a roster refresh be ? Will there be a guild point boost in the shop for gems, similar to the one from the last guild games ? Roster refresh price is still being determined. There will not be any guild point boost purchases during this event. No. But if you use a revive potion or ability on a dead hero before the end of the dungeon, they will remain available, so long as they are alive when you complete the dungeon. @Joel As difficulty increases, will there be a cap for guild points? - How do we get more courage, must we purchase it? - How are Zomminions handled at the end of a dungeon - if they end the dungeon alive, are we still able to use the hero a Zomminion replaced in our next dungeon run? @Joel Is the dungeon like the Tower, where your heroes do not recover HP between runs? HP is not regained, but energy is reset. It may have been stated earlier, but can you confirm (@Joel) a new epic will be introduced, but not a new hero with this event? Thank you. No new hero per Joel's post above. But a new epic would be cool! Nothing has been finalized either way at this point. Will there be event tickets ? 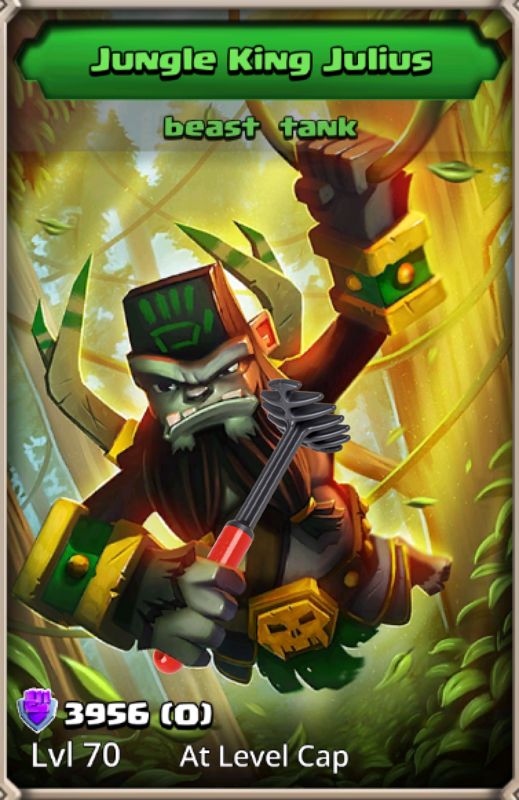 If Sifu is given an epic he will be OP. I’d avoid this to not create an imbalance in the game. It would be better to go give it to someone like Furnace, Black Diamond, Valkin, or Pontifex. Please let the team know that there is at least one person who is very happy with the way this event is being done. Awesome job on this event guys! Also, I love the fact that zomminions are not counted as the hero being 'alive', and thus are not available in the next dungeon run. I feel as though that would make the game way too easy. One question: How do we obtain this "courage"? By now, why are you running guild events past weekly reset? I mean, we beat this issue to death months ago in the Summit. You heard us, but are now reverting to the Monday end time. Do you really need to hear why this is important ... again? Did you forget? Jack Daniels or several good sources in Scotland are known to generate the liquid variety ! Please tell me there is a finite limit on the amount of courage one can purchase. Nothing like a spend $4.99 for 50 courage unlimited purchase please. This event is sounding like the most exciting Dungeon Boss event in the past year and any unlimited Courage purchase would destroy something magical. Considering the rewards are tiered, how would it destroy it? Yes the individual leaderboard will be mostly pay to win.. but they seem to always be and that only affects an incredibly small group of people. Someone with a good roster will still have a huge advantage over someone without one towards this regard. We will not be limiting courage purchases, but that's why the event is threshold based and not competitive. Well this event was fun while it lasted. A test of skill and strategy was a step in the right direction. Adding unlimited Courage purchases changed it from skill and strategy to instead Pay to Win. Might as well just skip the whole event and add some new runes to the event shop for $1,000 each. Less development time with the same net result. Thanks anyway, call me next week when you introduce a new hero. The only thing the unlimited courage purchases affect will be the individual leaderboards within a guild. Unless you're dying for that achievement/title, it will not in any way affect you. It's imperative they compete against themselves under fair conditions! Obviously no other guild would be silly enough to push far past the tier threshold for no reward, but now Potato Capped can't fairly rank their own players' skill against each other and thus the event is a COMPLETE DISASTER. Pack it up folks. It was nice while it lasted. That's completely inaccurate. Introducing an event based on one's ability to strategize is very exciting and engaging. Spending time coming up with the best combination of heroes and runes and pushing yourself to see how high of dungeon you can reach and then to be rewarded for your hard work is something special. Instead we now have run the dungeon. If you die a lot, spend $ and do it again. Do this 1000 times and you are the best. Yeah, that's not exactly engaging and challenging. No this won't impact my rewards, but since end gamers don't really need any more Corrupted hearts and other repetitive rewards ... it's more about enjoying the game. And Pay to Win events are NOT enjoyable. Outside of the individual leaderboard isn't this really just a pay to keep having fun if you want event? You aren't really winning anything. You're perfectly capable to setup an inter-guild competition to see who can push the furthest in the dungeon before resetting their roster and then you're accomplishing exactly what you are claiming to want. any heroes that are KO'd at the end of a dungeon run will not be usable again until the next day at 3pm CST, unless you do a roster refresh. As the dungeon gets harder, the amount of Guild Points paid out will increase. See, I really hate the Tower of Pwnage type deal where you have to worry about your hero being KOed. I would find it much less stressful if you just had to choose a different team of 4 every round regardless. Stressing out about my heroes getting KOed just makes me not want to participate in the event at all. The event went from "strategy required" to "strategy optional, as there's no theoretical limit to runs". It went from "the entire guild has a finite number of chances to reach max rewards, so use them wisely and collaborate to make the most of each" to "use what runs you get and some people can spend to make up the difference". There's no risk to bringing the wrong team or failing, neither on an individual level or a guild level. That's what takes the fun out. I'd much rather have a difficult event with limited retries where it's possible that NO GUILD gets the top threshold. Threshold events are fun, and I'm still excited about this new format... but it could be so much more interesting and intriguing if there was risk.